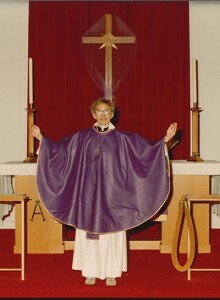 As “The Priest” Pauli Murray faces the camera with confidence, arms open wide in warm welcome and clad in her deep purple Chasuble. She was born to Agnes Fitzgerald and William Murray in Baltimore in 1910. They baptized her in their church, St. James’, the South’s first Episcopal Church established and led by African Americans. She grew up in the church her aunts helped to found, St. Titus’ Episcopal in Durham, North Carolina. She was confirmed at age 9 by Right Reverend Henry B. Delany, the Suffragan Bishop for Colored Work in North Carolina. She later visited Delany on his deathbed where he deemed her “a child of destiny.” Murray wanted to become an acolyte at an early age, but this was not allowed because she was female. Pauli Murray was ordained the first African American woman Episcopal priest in 1977 at the National Cathedral in Washington, D.C. She offered her first Eucharist in the Chapel of the Cross in Chapel Hill, North Carolina, the same church in which her grandmother was baptized a slave 123 years earlier. Murray served as pastor to two churches, the Church of Atonement in Washington D.C. and the Church of the Holy Nativity in Baltimore, Maryland before retiring at the age of 72. The Episcopal Church has officially recognized her in their listing of exemplary Christians, Holy Women, Holy Men: Celebrating the Saints in July of 2012. 3 Pauli Murray, Song in a Weary Throat: An American Pilgrimage (New York: Harper & Row, Publishers, 1987), 435.